Bushmaster AR-15 magazines are popular with shooters due to the high quality and reliability. 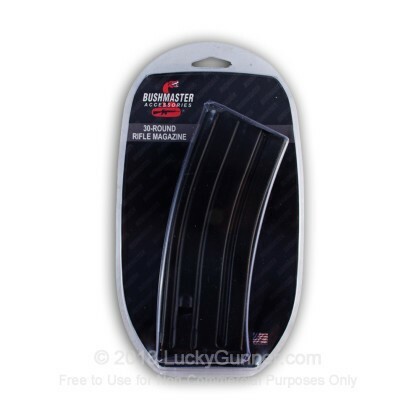 The 30 round AR-15/M16 magazine from Bushmaster is perfect for shooter's looking for a U.S.G.I. magazine. The aluminum box is stamped with a full "progressive" die to produce tightest tolerances. The welding process along the box seams has been automated to insure optimum weld ingot, strength and compliance with MIL-STD. The surface finish has been improved to meet or exceed MIL-PRF-46010 (required for U.S.G.I. magazines). Magazine boxes are treated with Molybdenum Disulphide ("Moly") for its exceptional adherence properties which ensure long lasting protection and lubricity - far superior to the PTFE (Teflon) used on other magazines. Finally, these magazines now have a new "anti-tilt" follower that ensures the round is fed into the chamber properly - preventing failure to feed problems. Drop tests have proven the advantages of the anti-tilt follower over the traditional green follower. As an additional aid, the followers are caliber marked - 5.56 in this case. Highest quality tempered steel springs, and Bushmaster logo stamped baseplates (removable for cleaning) round out the improvements on these superior magazines - which have been endorsed by the National Tactical Officers Association. This magazine is designed for use with M16/AR-15 rifles. I bought ten of these to beef up my mag supply. During the great AR drought of '013 I had to buy whatever I could get. Several of these "off brand" mags did not survive my less than gentle handling. I have used eight of the ten mags at the range and in the field with no problems. They load, feed and clean up very well. The other two I traded for some Chip McCormick .45 Mags. Apparently Bushmaster mags have trade value as well! As always Lucky Gunner was service oriented and delivery was quick. Price was reasonable but I would probably buy here even if they were cheaper elsewhere. shipped very quick, as usual. product was top quality, that is why is paid a couple bucks more for the bushmaster. fit and finish,perfect! It was a fast delivery and great customer service and when you call to order by phone they give you great hospitality and offer other accessories. Definitely recommended to other gun fanatics or gun accessories items. These are great magazines. Nice finish and work flawlessly. Magazines are well constructed, durable and lightweight. Loading is reltively easy depsite the vertical angles on the sides (which is typical of AR-15 style mags). I plan to buy more if/when needed. I bought five of these to get the discount. I've tested three so far in my SIG 556 and they've all functioned perfectly. These are very light aluminum, but appear to be tough enough. I don't know what the black coating is, but it seems pretty high quality too. If you don't like plastic, but want something light but still solid, buy these. Well built magazines. They work well in my AR. I own a Bushmaster AR. Quick delivery and reliable mags.